Tree houses have captured our imaginations for many years. These rugged homes amid nature have appeared in such classics as "Peter Pan" and "Robinson Crusoe." 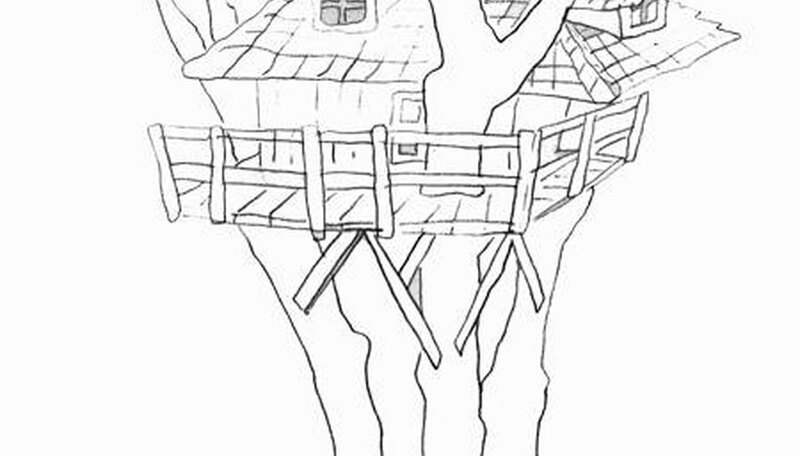 Many children build their own tree houses each year and still more adults help their children construct these tiny but wonderful houses. 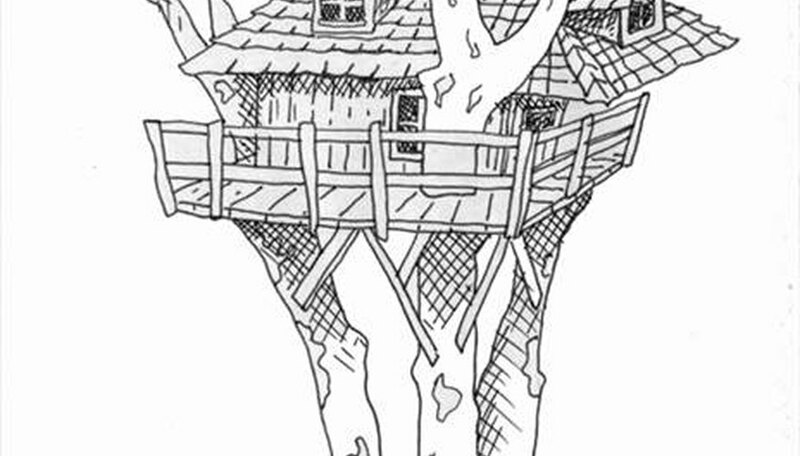 This article will teach you how to draw a complex tree house using basic shapes and some advanced pen and ink drafting techniques. 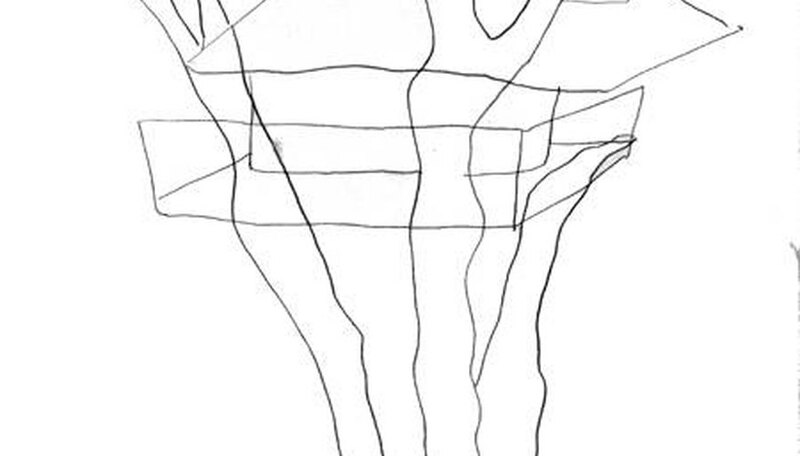 Begin by drawing the tree upon which the rest of the picture will be placed. Start at the base and draw the roots with soft triangular shapes. Think of this as an almost octopus-like shape or a star pattern. Do not draw straight lines because you want natural-looking roots. Branch the tree out into three main parts and extend these to the top of the page. Each trunk of the tree should be a different shape just like in nature. On the left side, draw the trunk with two parallel lines going up diagonally up the page. 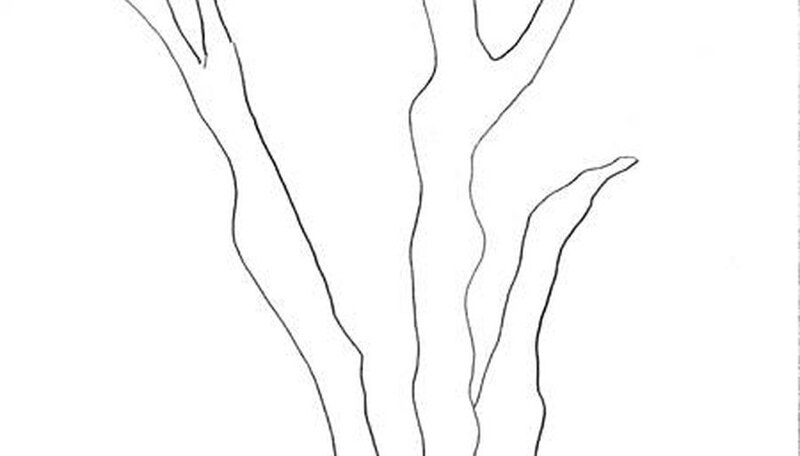 Add small bumps in the lines as you draw the lines to indicate knots and give the tree an organic shape. Insert a thin "U" shape into the the top of this to create the branches at the top. Draw the middle trunk of the tree with two organic parallel lines extending up the middle of the page. About two thirds of the way up, split the parallel lines in a "V"-like shape to show limbs branching out. At the top of the left branch add another "V"-shaped divergence. Create the third tree trunk by drawing two lumpy parallel organic lines extending at a slight diagonal to the right. Connect these lines in a small point about two-thirds of the way up the page. Draw the leaves with at the top of the branches. Create the jagged patterns of the leaves by drawing a line that dips inwards and then outwards again. Swoop the lines around the top branches with organic upside down "U" shapes. Have the some of the branches overlap the leaf pattern to add realism. Lay the frame of the tree house across the tree. Don't worry about overlapping lines as you will erase these later. Add horizontal rectangular shapes across the three main tree sections one on top of the other. Add a triangular shape on the right hand side of the tree house for a window. Flesh out the details on the house. Add support beams with diagonally placed rectangles under the house that connect to a tree trunk. Add one support beam on the left tree trunk extending diagonally to the right. Add two support beams on the middle tree trunk extending diagonally to both the right and left. For the last support, add a support beam extending diagonally to the left. Add the fence with perpendicular rectangles that extend horizontally across the tree trunks and house. Create a chimney with a cylinder on the roof of the tree house. Add shingle guidelines by drawing a net like pattern over the entire roof. Add windows to the front, side and top of the house with cross shapes inside squares. Erase the overlapping lines. Add textured wood beams to the walls of the house with vertical broken lines. Create a whiff of smoke coming from the chimney with a wavy lines. Ink the entire drawing. Let the ink dry and erase all the pencil. Add shadows with crosshatching under the roof, base of the house and where the leaves cast shadows on the limbs of the tree. 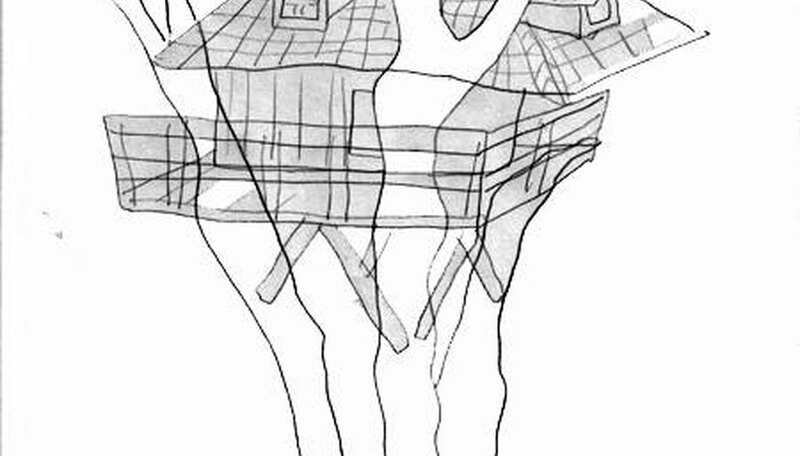 Cross hatching is done with small diagonally lines that overlap each other in a cross or "X" pattern. Darken in the windrows with crosshatched lines. Finally, add moss to the tree with wavy oval shapes on the base, trunk and limbs of the tree for added detail and realism. Keep the lines on your tree looking organic by avoiding angular or straight lines. Instead add soft curves and bumps to the lines to make the tree look more natural.